Defense health officials say they are making inroads in improving beneficiaries' access to health care and services and proposed changes to military health care in the fiscal 2017 budget should enhance those efforts. Dr. Jonathan Woodson, assistant secretary of defense for health affairs, and Defense Health Agency director Navy Vice Adm. Raquel Bono told Congress this week that the Defense Department must ensure the readiness of its military hospitals and clinics as "full-service platforms" to make sure medical personnel preserve their trauma, disease and non-battlefield-injury treatment capabilities. But at the same time, they added, the Tricare program and the military hospital system must be tweaked to be more responsive to patients. "We enter 2016 confident that the reforms in the military health system and the health benefit can be further strengthened through a combination of legislative and operational reforms," Woodson told the personnel subcommittees of the House and Senate Armed Services committees during two separate hearings. Among the reforms proposed in the DoD's $48.8 billion health budget is an effort to streamline Tricare into two programs: a health-maintenance organization similar to the current Tricare Prime that is limited to areas around military hospitals and clinics, and a hybrid of Tricare Extra and Standard that would allow beneficiaries to use civilian doctors. Both programs would require higher fees for those who prefer civilian care, and military retirees and family members who are not eligible for Medicare would pay annual enrollment fees regardless of which program they selected. Currently, the non-Medicare-eligible group of beneficiaries pays cost-shares but no annual enrollment fees to use Tricare Standard. Woodson said the proposals and other initiatives will help alleviate the biggest complaint from patients, especially those at MTFs: they can't get appointments. 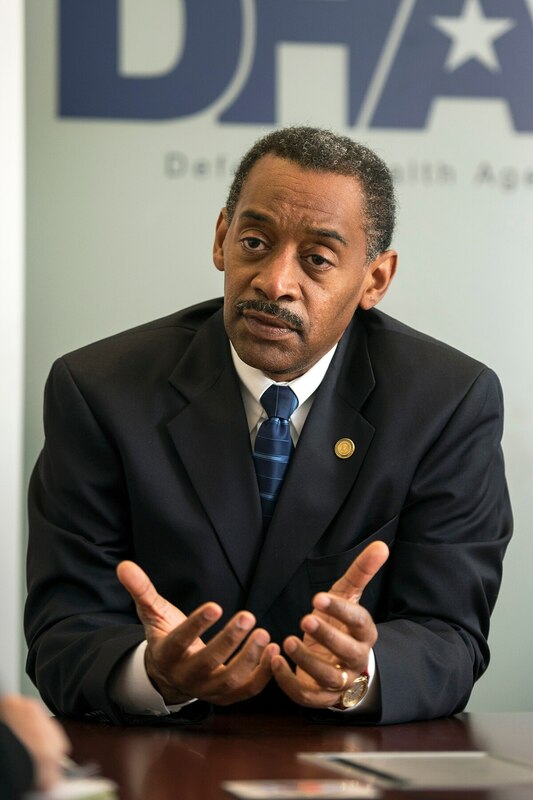 "We've heard loud and clear from our beneficiaries that access to primary and specialty care needs attention, particularly at our military treatment facilities," Woodson said. Active-duty troops and their families would not be required to pay annual fees for health care. They would also be able to continue using military hospitals or clinics for free, and those in the civilian provider option, would have no network co-payments with a referral but would make co-payments without a referral. The amount of the co-pay would depend on what type of care is needed. Responding to a question on what beneficiaries would receive for their higher payments, Woodson said the new Tricare includes a "modest fee increase that gives better freedom," and with the preferred provider organization option, the referral requirement, what Woodson described as a "major dissatisfier to our beneficiaries," would go away. Woodson said the average active-duty family of four would see its share of total health care costs rise from about 8 percent to 10.4 percent. He added that the new program would have catastrophic caps below industry averages and offer a second-payer option that would allow beneficiaries to use Tricare as a supplement to other private insurance. "What you have to say is helpful, but we have to find ways of doing it in a quicker elevator speech so people understand immediately how it affects their families," ranking member of the House Armed Services personnel panel Rep. Susan Davis, D-Calif., said. "People are concerned about the increases and they want to know they are getting something for it." Congress has held four hearings since December on defense health reform, with an eye toward optimizing the benefit now and creating a sustainable one in the future. The Military Compensation and Retirement Reform Commission last year recommended several major changes to the defense health system, to include consolidating the three individual service medical commands under one readiness command and moving all beneficiaries who are not on active duty to private health care programs. The commission also recommended improved collaboration between the Defense and Veterans Affairs departments, with commission members saying joint health care could be accomplished and would be more cost-effective. This collaboration already is underway at some facilities, where active-duty troops, veterans and family members get their care side by side. Most notably, the James Lovell Federal Health Care Center in Chicago is a fully integrated, joint DoD-VA facility that Woodson said has served to illustrate that the two departments can benefit from interoperable care. Military retiree and Rep. Mike Coffman, R-Colo., was having none of it. Coffman said he will work to ensure that military and veterans facilities remain separate. "We need to reform the VA, but until it is reformed, I don't want to see them taking care of active-duty or our active-duty families. The departments have different standards and different standards of care," Coffman said. "If I have to get this into the [National Defense Authorization Act], I will. It would be wrong for our military families." During the Senate subcommittee hearing Tuesday, the service surgeons general said their priority is to preserve readiness in order to maintain the high standard of battlefield medical care set in the last 15 years of war. This means preserving the military hospital system and treating active-duty families at these facilities, said Air Force Surgeon General Lt. Gen. Mark Ediger. "Our success in support of deployed operations is inexplicably linked to the care we provide in our hospitals, our clinics and our many partner institutions. The bedrock of our readiness is the military hospital," Ediger said. "Reforms must not degrade our combat-tested system or readiness in an environment where we must remain rotationally focused and surge-ready [because] the next large-scale deployment could be tomorrow," Army Surgeon General Lt. Gen. Nadja West said. Noting that a Navy corpsman was awarded the Silver Star two weeks ago for defending fellow troops and treating casualties inside a kill zone, Navy Surgeon Gen. Vice Adm. Forrest Faison said the Navy is committed to reform to improve patients' experience and their health. "More needs to be done and none of us underestimates the effort required to improve our peacetime health care services," Faison said. "However, we must do so without putting at risk the very system which has yielded such unprecedented survival."